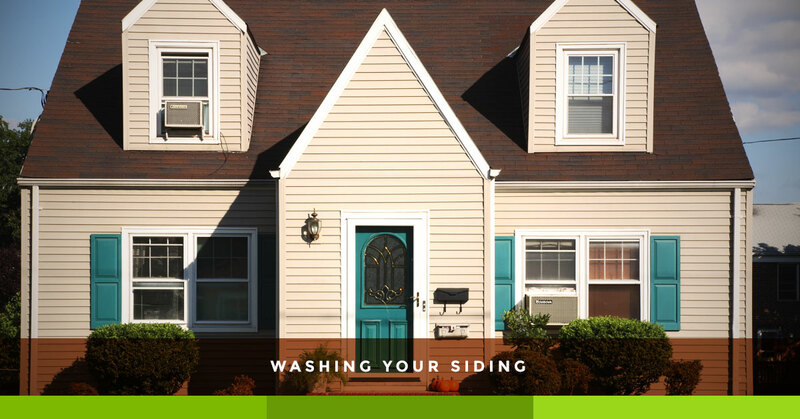 If your home’s siding looks a bit dirty, then it’s time to pull out the pressure washer. Don’t have one? You can rent a pressure water for a decent price at most hardware stores, or you can hire a professional power washer to do the job for you. If you are going to tackle this clean-up project yourself, we have all of the advice that you’ll need to do the job right, without damaging your siding. As Denver’s source for siding installations, we understand how valuable your siding can be, and we want you to get the most value out of your home’s first defense against Mother Nature. Here are some tips that you can employ to clean up your home’s siding while ensuring that it remains well intact. Before we dig into the how-to part of this article, let’s address a few safety concerns that you should keep in mind throughout the process. First of all, we urge you not to use a ladder. Do not use a ladder to clean siding that is high up, since pressure washing will wet the rungs of the ladder, and the pressure from the device may throw you off balance while you’re high up. Instead, invest in an extender nozzle for your power washer, or use scaffolding that is rigid and supportive. If you can’t reach some places across the exterior surface of your home, then it may be best to hire a professional outfit to clean your home’s exterior for you. Also, you should wear safety glasses throughout the process. Pressure washers shoot water and air at high velocity, effectively blasting away any dirt that has stuck to your home. That dirt ends up airborne, and it can make its way into your eyes at a pretty high velocity. So protect those eyes, wear safety glasses. Before you get started, you should prepare the space that you are working on. 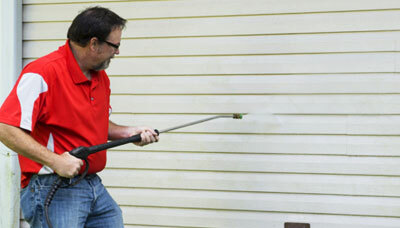 Remove any obstructions from the area that might trip you up as you move around with a power washing wand and hose. For example, if you have lawn decorations that could snag one of your shoes, it’s best to remove them now. Be especially wary of any power lines that may be nearby. Hire a professional if you are forced to work too close to power lines. Finally, you should shut off power to any outlets that are near the siding that you’re working on. Since you’re working with water, you shouldn’t have an active electrical source nearby. Shut off any exterior outlets at the breaker box — you should also test to make sure that these outlets aren’t live any longer, simply plug in a device to see if they’re off. If you have older siding on your home, you should be wary that it may be painted with lead, or it may be asbestos siding. If you’re uncertain about the paint of your siding or the composition of the siding itself, you can have a siding expert inspect your siding before you get started. If you do have siding with a lead-paint layer, you should hire a professional to clean your siding, since that lead can become airborne and end up in your lungs. If you have asbestos siding, you may consider replacing that siding — again, you’ll have to hire a professional who is trained to provide asbestos abatement. While there’s no black and white rule about when to power wash your home’s siding, you should clean your home’s siding roughly every two years. Of course, you can clean it more often if your siding happens to get dirty sooner. Power washing your siding will help to ensure that it doesn’t get covered with mold and mildew, which may actually damage certain types of siding. In addition, you should power wash your siding if you’re about to paint your home. Just be sure to let the siding dry completely before applying that first coat of paint. Now that you know when you should power wash and how to do so safely, it’s time to track down all of the equipment that you’ll need to do the job right. While you can use an electric power washer, these machines often have far less power than their gas-powered cousins. Consider a gas-powered pressure washer to make quick work of your home. These units pack more pressure capability, which makes them ideal for larger home or homes with plenty of space that is difficult to reach. You should find a unit that has a 2.3 GPM rating or higher to have enough pressure to blast away any dirt on the siding of your home. When it comes to the nozzle of your power washer, you should use a 25 degree or 45 degree nozzle. These angles are best for siding, since you will be able to clean off siding that is overhead, even from the ground. Again, get an extender or use scaffolding if you can’t reach the whole of the siding on your home. You should also invest in a detergent that you can apply to the exterior of your home before you spray it down with a power washer. Buy a detergent that is designed for home siding, and follow the directions on the packaging to make quick work of cleaning your home. Before you get started, you can prep the exterior of your home by taping off any vents and openings that shouldn’t get wet. You can use cardboard cutouts and duct tape to do the trick — just be sure that you are taping against a surface where the duct tape can be removed easily. Use painter’s tape for delicate surfaces. One more thing before you get started: you should protect any belongings that are nearby your home’s exterior. Throw a tarp over the air conditioner unit for the time being (and shut off the unit until you’re finished). Move any outdoor furniture that is in the way, and be wary that it can get covered in the dirty spray from your pressure washing. Also, move your vehicles into the garage or away from your home, since you can get them dirty with all of that debris in the air. Start your power washer, give it a few blasts to make sure it is working properly, then start spraying your siding with the nozzle a yard away from the siding of your home. From there, you can keep the pressure flowing as you move the nozzle closer and closer to the house, until the washer is effectively removing the grime on the surface — you do not need to move any closer to the house, since you may accidentally damage the siding. Once you have the distance down, work from the top of your home to the bottom, since the grimy water will run down your siding to the ground. If your siding is outdated and requires repairs or replacement, then you can count on our crew. We provide siding installation services for folks throughout Lakewood and the Denver area, and we’d be happy to install siding to protect your home. Get started by giving us a call!